Manchester’s CityVerve project brings together 21 organisations – including BT – to create a blueprint for smart cities of the future. Running from July 2016 to June 2018, it sees local authorities, start-ups, universities and major technology partners apply the latest Internet of Things (IoT) innovations to a number of use cases. They’ll show how IoT can help improve healthcare, make streets and transport safer, and inform and empower citizens. CityVerve’s use cases are based around four themes: transport and travel; energy and the environment; health and social care and culture and the public realm. From allowing passengers to ‘check in’ at their bus stop (so providers get a better picture of service demand), to smart lighting that responds to the movement of people, everything is designed to have a positive impact on Manchester’s citizens. Backed by a £15m collaborative R&D budget (including £10m from the UK government), CityVerve’s use cases will show how a smart city programme can be rolled out across the world. They’ll demonstrate the benefits that IoT technologies can bring, as well as the challenges of applying them at scale. CityVerve isn’t the first project of its kind to explore how IoT can improve cities, but it is unique. Manchester’s local authority – thanks to increasing devolution from Westminster – has more control over education, health and transport policy than other cities, making it a trail blazer. That gives it more flexibility when it comes to applying IoT technologies, and using the data it generates to inform decision-making. The city’s geography and demographic is large enough to make it a true testbed for other urban areas, too. CityVerve’s unique approach doesn’t end at its local authority powers and geography, either. Collaboration is high on the agenda here – between partners and with the public. With everyone working together and pooling expertise, CityVerve is pioneering a way of thinking that’s never been applied to a smart city project before. At the heart of this large-scale collaborative project is the need to do more with data, and take it outside of traditional silos. That job comes down to BT. ‘Connecting the unconnected’, that’s how Professor John Davies, lead researcher at BT, describes BT’s involvement in CityVerve. BT’s IoT Data Hub – one of a handful platforms that make up the project – sits at the heart of CityVerve. It plays a vital role in bringing together hundreds of travel/transport and other data feeds generated by different use cases, sensors and organisations across Manchester. With around 200 separate data feeds to work with, bringing them all together in a way that is easy to manage, interpret and work with is vital. By creating an IoT data hub, data silos can be broken down and developers can easily see what’s available and use it as part of their applications. That lowers the barriers to participation when it comes to creating new services and solutions with CityVerve’s data. That means everyone can get involved – from large organisations to individual, entrepreneurial developers. The combination of different data feeds means more novel and better insights, and therefore better services for Manchester’s citizens. The challenges of bringing together so many different data feeds go beyond making them discoverable. With many different data providers involved, BT had to make sure that their individual terms and conditions for data use were respected. As a result, the BT CityVerve data hub allows data providers to supply data feeds under their own terms and conditions, and even charge for usage, if they wish. In one example from the project’s 20+ use cases, BT are partnering with See.Sense, an innovative cycling company from Northern Ireland, to provide sensor-enabled and connected bike lights to up to 180 cyclists across Manchester as part of CityVerve, the UK’s smart city demonstrator. The See.Sense light sensors, known as ICONs, connect via Bluetooth to an app on Android phones. The app will transmit anonymised data on the cyclist’s environment – such as the quality of the road surface, light levels, as well as cycling routes, collisions and near-miss events – back to BT’s data hub. As explained above, many hundreds of IoT data feeds are collated by the BT hub and presented in a uniform way for innovators and city planners working with CityVerve. Easy access to the data will help developers turn innovative ideas into applications in many areas, including planning ways to improve cycling infrastructure, and creating policies to promote cycling in the city. The heatmap in Figure 1 shows popular cycling routes across Greater Manchester. Another area where BT has been active in the project is by looking at ways to improve air quality by understanding its correlation with traffic volumes. 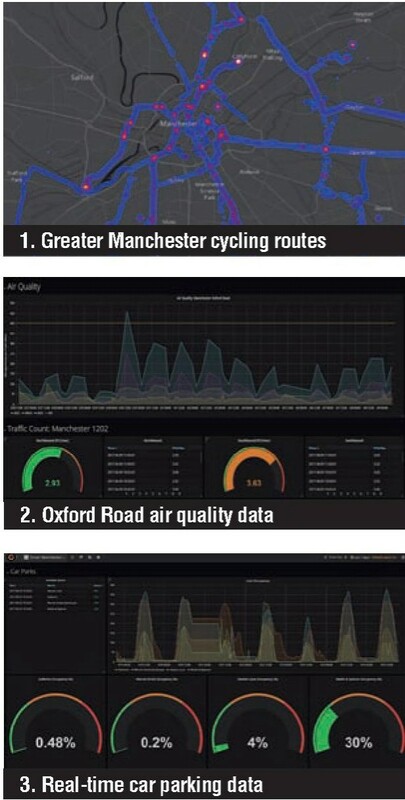 Figure 2 shows the variation of air quality over time on Manchester’s Oxford Road, along with two dials in the lower half of the figure showing the traffic volumes on the northbound and southbound carriageways of the same road. Combining these data sources allows us to understand the traffic volumes which trigger air quality issues. As these traffic volumes are approached, traffic system interventions such as changes in signing and signalling can be implemented to reduce the traffic count and thereby avoid a potentially harmful reduction in air quality. The BT data hub collects real-time car parking data from across Manchester. Figure 3 shows live occupancy data from four car parks on the dials at the bottom of the screen, while the graph at the top of the image shows how occupancy varies over time. Manchester City Council, BT and their partners on the CityVerve consortium are executing an exciting and innovative Smart City programme, implementing a range of use case to demonstrate how technology can deliver data-driven insights and analysis to help local authorities to maximise the use of scarce resources and to deliver enhanced citizen services.